If you're a fan of the Brotherhood, you can't afford to miss Assassin's Creed Origins. 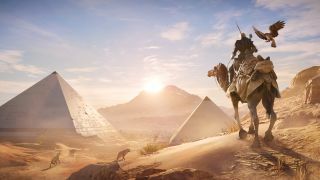 After a year off for the franchise, Bayek's journey through Ancient Egypt is a beautiful and thrilling return to form for Ubisoft's free-running series. With camels, mummies, tombs and more crocodiles and lions than you can shake a very pointy stick with perks at, Origins has all of Egypt at your disposal. When you're just starting out in Ancient Egypt, there's a whole lot to learn very fast to make sure you're not constantly having your head eaten by lions and being set on fire by high level enemies. Different regions have different levels of foes so keep an eye on the level above enemy heads and even animals as a red skull will nearly always indicate a very speedy death for you, even if you're feeling OP with a nice shiny weapon. If you're just starting out in Assassin's Creed Origins, the amount of stuff you can do may seem a little daunting. Handily, we've compiled a selection of hints and tips to help you make a successful start - these are 12 essential Assassin’s Creed Origins tips to know before you play. An RPG system is the latest addition to the Creed and that means you're going to care about XP for the first time while running around with a hidden blade. Use our handy guide for how to level up fast in Assassin's Creed Origins to reach those lofty heights as fast as possible. In a game as expansive and gameplay rich as Assassin's Creed Origins, it's inevitable that you'll have to discover some of the cool things you can do as Bayek for yourself. We've done the hard work for you, to figure out 10 Assassin's Creed Origins hidden mechanics you're never told about. A series of Ancient Mechanisms hide beneath the sands of Egypt and they require one thing and one thing only to spill their secrets. Silica. And lots of it. Thankfully we've got a guide that covers your best places to find Assassin's Creed Origins Silica. It's time to go tomb raiding. Just mind the cobras. They really don't like having guests over. One of the many secrets to discover as you explore Ancient Egypt with Bayek are 12 mysterious stone circles, each of which presents you with a star gazing puzzle. The reward for solving all of these is well worth getting, so to get started here's where to find all of the Assassin's Creed Origins Stone Circles. One of the big secrets buried in the sands of Assassin's Creed Origins is the super fancy Isu Armour set, which gives Bayek a very distinctive look. We don't want to say any more here in case we verge into spoiler territory, but if you want to snag the best wardrobe item in the game then here's how to get the Assassin's Creed Origins secret armour. There might not be as many collectibles this time around but one of the ultimate puzzles across Ancient Egypt is hunting down the 29 Assassin's Creed Origins papyri scrolls. Nab the papyri scroll and you'll get a riddle to find some rare or legendary treasure hidden throughout the world. Here's our guide to finding every single one and the treasure locations for each. From links with other Ubisoft games, to a barrel rolling bird companion and a desert bug storm, there's plenty of hidden secrets to discover in Assassin's Creed Origins. We've picked out our favourite Assassin's Creed Origins Easter eggs, and don't forget you can also ride a unicorn!